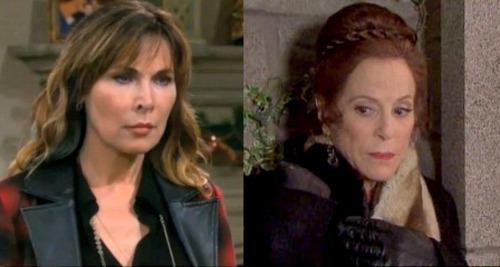 Days of Our Lives (DOOL) spoilers tease that some shockers are coming up in the week ahead. 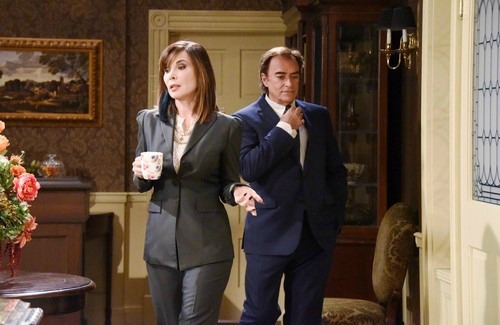 First, let’s talk about Kate’s (Lauren Koslow) ghostly visit from Andre (Thaao Penghlis). She’s had a hard time since his death and it’s not just because she’s mourning the loss. In light of Andre’s sneaky betrayal, Kate feels unsure of his love for her. She’s wondering if Andre’s feelings were even real. Perhaps that’s what this apparition encounter’s about. Andre may appear to Kate and offer her some closure. It seems obvious that despite his hidden agenda, Andre cared deeply for Kate. He truly fell in love with her, but that didn’t exactly fit with his plans. Andre may express regret for deceiving Kate. If he had everything to do over again, he would obviously bail on that plot with Vivian (Louise Sorel). Not only did it hurt Kate, it also led to his death! Abigail (Marci Miller) wouldn’t have had a reason to confront Andre if he hadn’t gone behind Kate and Chad’s (Billy Flynn) backs. They wouldn’t have fought and she wouldn’t have killed him in self-defense. Nevertheless, what’s done is done. All Kate and Abigail can do now is move forward. Days spoilers say Abby will achieve that by taking responsibility for her actions. Will Kate have to take responsibility for hers as well? Hope (Kristian Alfonso) and Rafe (Galen Gering) are suspicious since the forensic report doesn’t match Kate’s claims. Did Vivian really die in a struggle or did Kate grab the gun and kill her? That brings us to DOOL’s next bombshell. Days of Our Lives say Vivian will come back from the dead on May 23, but things may not be exactly as they seem. Soap Opera Digest already confirmed Vivian’s exit, but perhaps Days kept her final scenes under wraps. We know Vivian was injected with what we assume is Dr. Rolf’s (William Utay) drug. However, Will (Chandler Massey) needed plenty of time to recover after his injection. He also can’t remember anything about his past life. Even if Vivian’s OK mentally, she still suffered a gunshot wound and major surgery. Will she really just waltz up to Kate or someone else like everything’s normal? Perhaps this return from the dead will really be a fantasy for Kate. She might imagine Vivian “haunting” her out of guilt. Plus, Days spoilers state that Stefan (Tyler Christopher) will focus on avenging his mother’s death. It seems he’ll continue to believe Vivian’s gone for good. Regardless of how this plays out, Vivian won’t be sticking around. DOOL fans will just have to say goodbye! Still, it sounds like Kate will deal with some spookiness. We’ll give you updates as other Days of Our Lives news comes in. Stay tuned to the NBC soap and don’t forget to check CDL often for the latest Days of Our Lives spoilers, updates and news. Days of Our Lives Spoilers: Sami’s Comeback Leads to EJ Reunion – ‘EJami’ Fans Get Their Wish?